People often ask me “what is your favourite herb?”. My standard reply is “It depends!”. When it comes to culinary herbs (the only kind I grow) I have several favourites of equal status, influenced by the time of year or the type of dish I’m cooking. Thus chives, dill, parsley, basil and thyme would be by more most-used herbs while mint (various kinds), sage, chervil and oregano would follow a little way behind. I’m not keen on the flavour of anise so fennel lags a little behind, though I still grow and use it quite regularly. But the herb for which I have the greatest affection, just as a plant to grow and all culinary reasons apart, is rosemary. Where cooking is concerned I class rosemary with my B list favourites, though when it comes to lamb and roast potatoes this has to be a Number One choice. To me, the main virtue of rosemary in a dish is that its resinous flavour offsets fattiness – one reason of course why it goes so well with lamb. But rosemary works equally well with both pork and beef spareribs, adding a keen edge to the overall eating experience. The real reason I am so fond of rosemary, however, is because it is more aesthetically pleasing than most herbs and very rewarding to grow. A little rosemary in the kitchen goes a long way but because it’s a useful landscape plant I grow a lot of it anyway. It’s a great plant for borders (my herb garden is bordered with trimmed rosemary), rockeries (because it likes good drainage), dry spots, pots, or just as a single specimen. One of the most effective simple garden beds I ever saw was in Italy, on a dry hillside, where six parterres of clipped rosemary each encircled a single white rose bush. 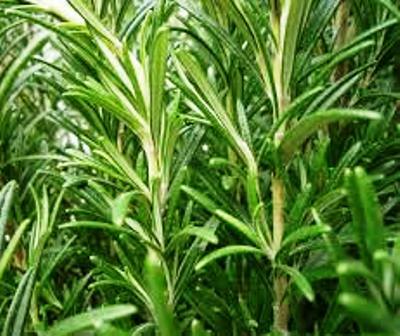 Rosemary grows in all but very tropical climates with heavy monsoon rains and though it looks at its best and lasts longest in Mediterranean and warm-temperate climates it adapts very nicely to desert and subtopical zones. It can even be grown as a summer plant in cold climates, but heavy snow will kill it so it should be kept in a pot and brought into a warm, protected environment in winter. Rosemary comes in various forms today; some have bright green leaves while others have the traditional grey-blue foliage. This has the most flavour and comes from “hardening” the plant with full sun exposure and a low water regime. Regular watering and part-shade will produce a softer, greener foliage with reduced flavour. This plant is so versatile that the different climates merely mean a slightly different management regime. As with lavender, in my subtropical mountaintop climate I don’t treat rosemary as a perennial in the real sense of the word but replace my bushes every five years for maximum good looks. The plant continues growing long after that but starts to look straggly. In colder and less humid climates rosemary bushes keep their looks a lot longer. The basic rules for rosemary are good drainage, regular watering (but not over-watering), and regular tip pruning with a good cut back (about one third) in autumn. This means profuse flowering when spring comes round again – and my rosemary flowers from spring right through to the following autumn. I don’t give my rosemary any fertilizer as such but add a dose of compost around the base of newly-planted seedlings about three months after they go into the ground. I repeat this once a year in late spring, Pot plants get fed twice a year with a cheap all purpose liquid fertilizer . Avoid high nitrogen fertilizers or plants will be reluctant to flower. 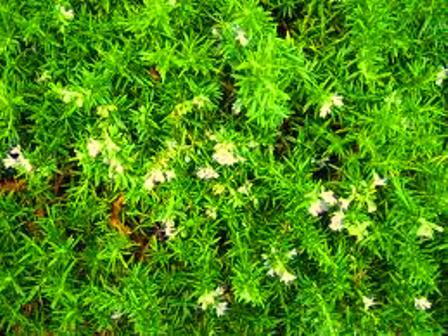 My soil is rather acid so I sprinkle dolomite around my rosemary bushes twice a year, in early spring and late summer. The best mulch for rosemary is gravel – the paler in colour the better. This will warm the plant, help prevent root-rot diseases and protect the shallow roots from heavy rain and soil erosion. It will also keep down weeds. 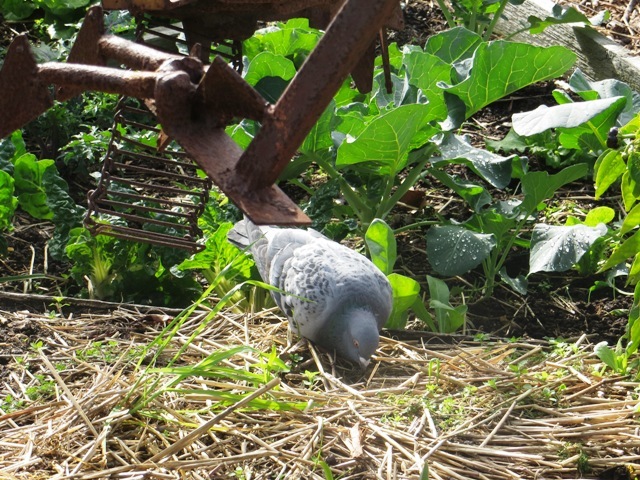 Coarse bark is also an acceptable mulch, or nutshells, but “soft” mulches such as hay and leafmould will encourage the root-rot pathogens that are the only problem that ever seems to effect this tough herb. Whether or not rosemary actually stimulates the memory, as has been claimed, I’ve no idea. Some recent studies do tend to indicate that its scent has some beneficial effect on brain function but this isn’t conclusive. I DO know that this plant looks good all year, gives a healthful smell to the garden, is useful in the kitchen and as a dried herb for fragrancy in drawers and cupboards, is much-loved by bees, versatile in landscaping – and requires very little effort to grow. The rose of Mary – you don’t have to be a Christian to appreciate the grace of this name. No plant, in my opinion, deserves it more. Rosemary flowers are usually a deep lavender blue though various shades of this colour are available. One form is so pale that it appears to be white. Best place to Veg Out! 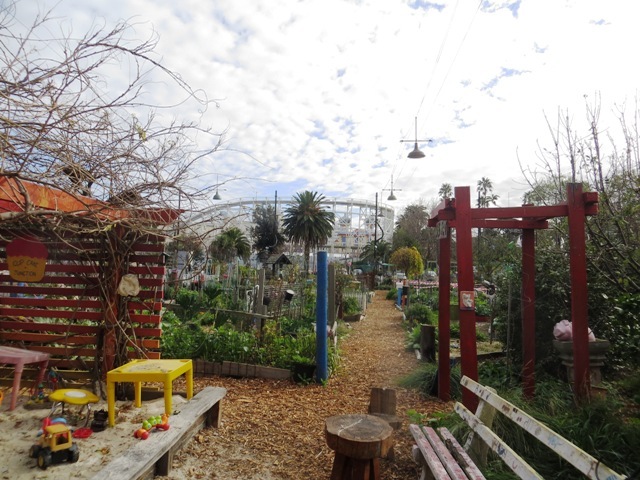 In the heart of Melbourne’s fun and funky St Kilda lies Veg Out, a community garden like no other I’ve seen. It’s not very large, just about big enough for a large block of apartments. 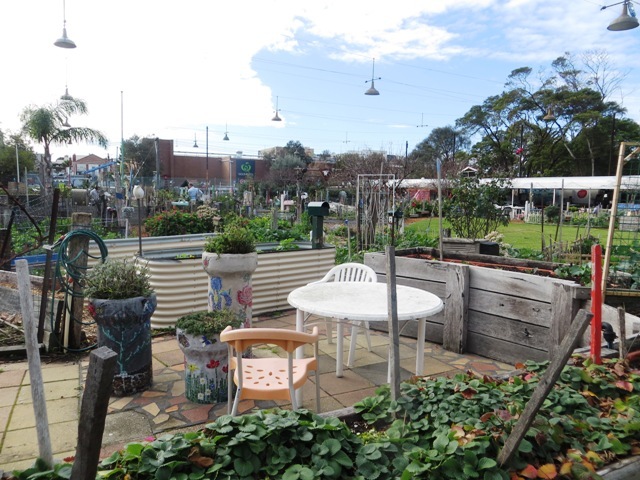 But it’s a little green gem in a busy metropolitan area, just a spit from the ocean, that has lodged itself firmly in the hearts of St Kilda residents. 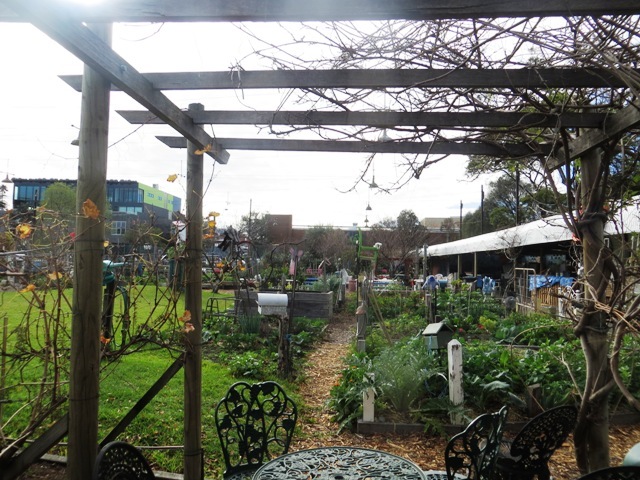 The garden, which like St Kilda itself is full of colour and joy and good things to eat (St Kilda has the most best cake shops per square metre anywhere in Oz) is on the site of a former bowls club. The land has been set aside for community use since 1881 and is administered by the local city council on behalf of the State Government. Volunteers oversee the operation of the garden which is divided into 145 little plots plus communal space. 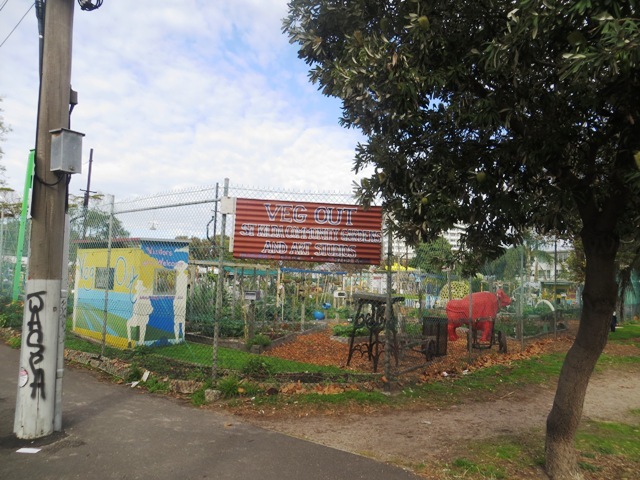 Ten of these plots are leased by community groups, the rest by individual growers. Cost is only $8 a square metre a year (less for concession-holders) – but the waiting list is very long. Those keen to get started first join the “Friends” group, take part in working bees and generally demonstrate their commitment while waiting for a lot to become vacant. 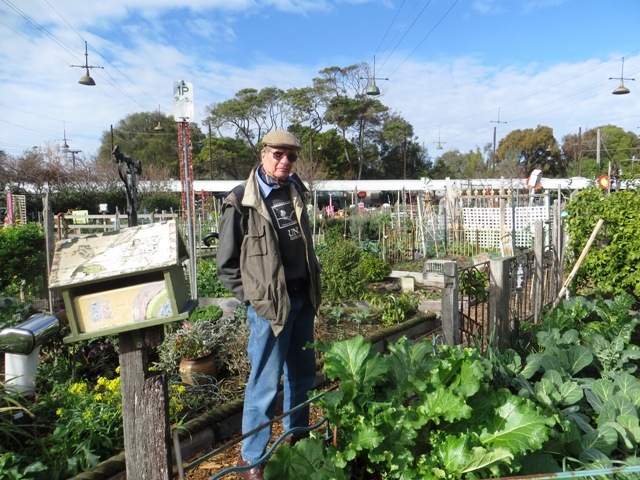 Even in the middle of winter, when I visited, the Veg Out plots were rich with green leafy vegetables and herbs. 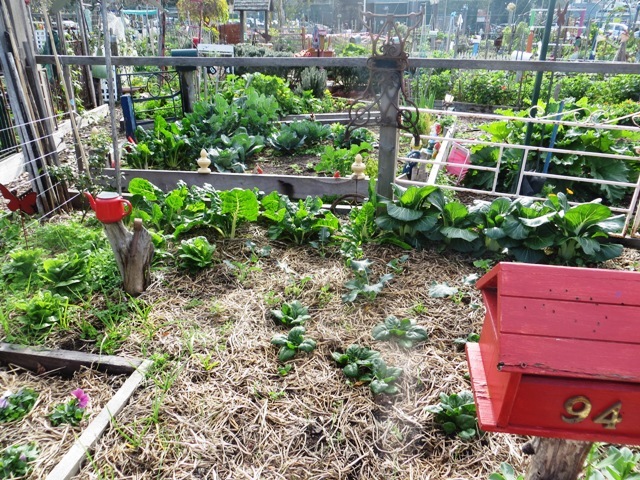 I liked the way there appeared to be no obvious dividing lines between the plots; instead, you can make your way soft-footed along the mulched paths that wander throughout, admiring the contrasting crops along with the bits of garden art that add quirky grace notes. 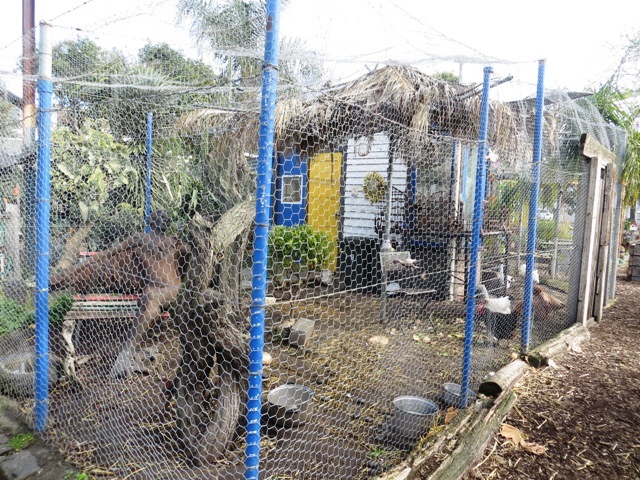 There are chickens, too, and quail and rabbits. The rich smell of compost fills your nostrils because, as you’d expect, composting is big here and the catchcry among the Veg Out volunteers is Stop Think Chop. 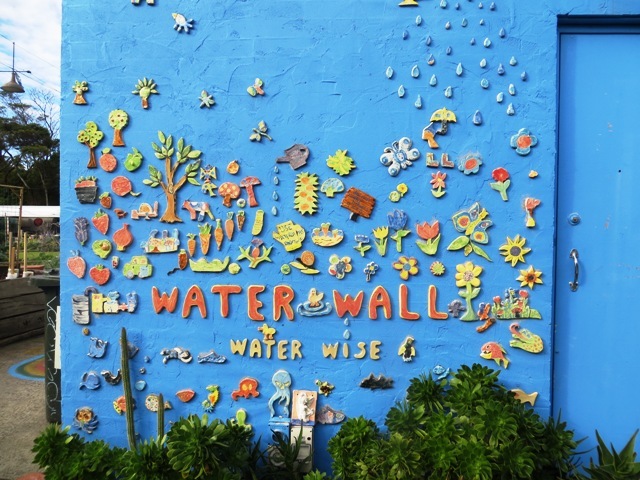 Water conservation is also emphasised and restrictions on using the available town water are imposed. St Kilda, with its long and curving sandy bay, has become prime real estate. 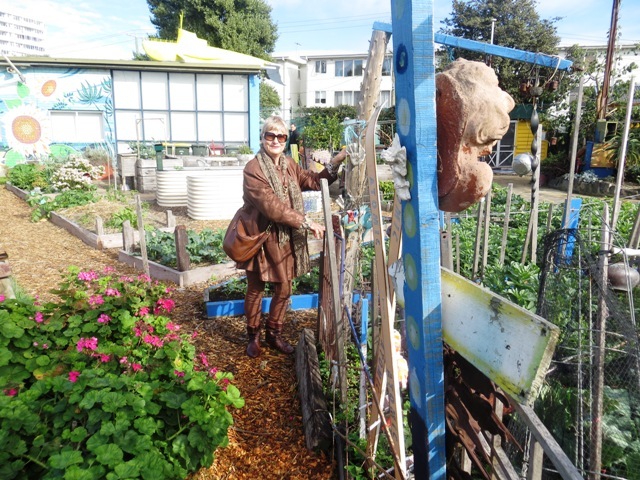 And the community garden is very close to the beach, surrounded by multi-million dollar apartments and commercial buildings. 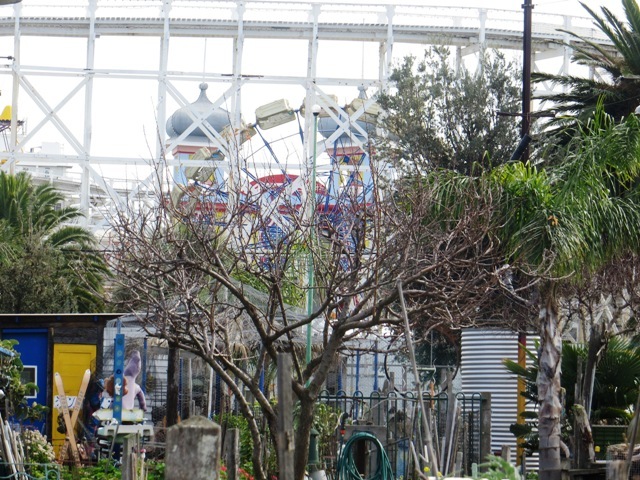 And with the razzmatazz of Luna Park on one boundary. Yet there it is, thriving and full of activity. 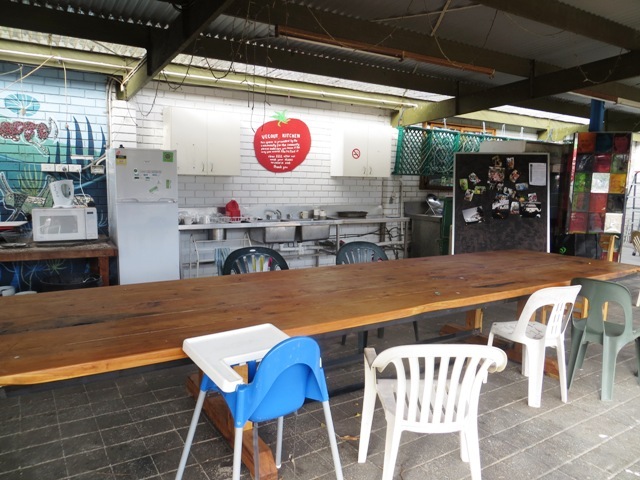 This is very much a family affair and the meeting area offers pram parking as well as chairs and tables and sinks and all the infrastructure for relaxing in between the hoeing and the mulching, and exchanging growing tips with plot neighbours. For novice gardeners there is plenty of friendly advice available, including a vegetable planting guide. 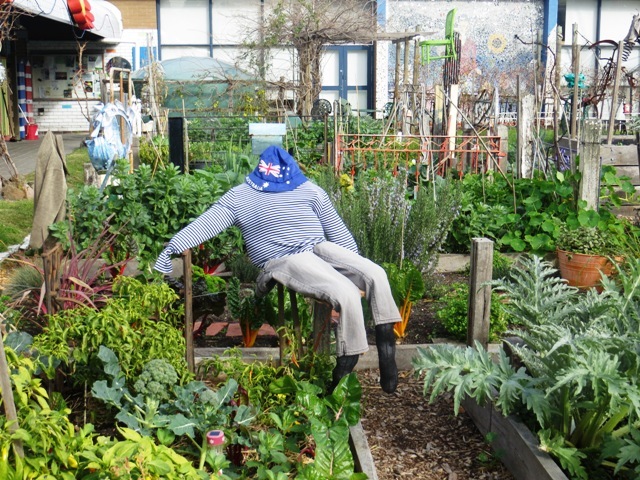 And of course everything in THIS garden is organically-grown and chemical-free. 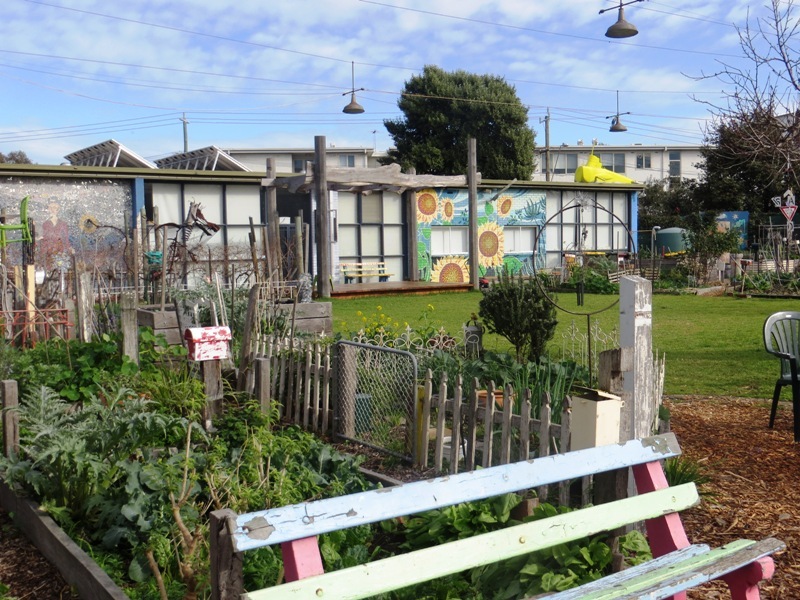 I really loved this happy little garden – it’s everything a community garden should be and then so much more. 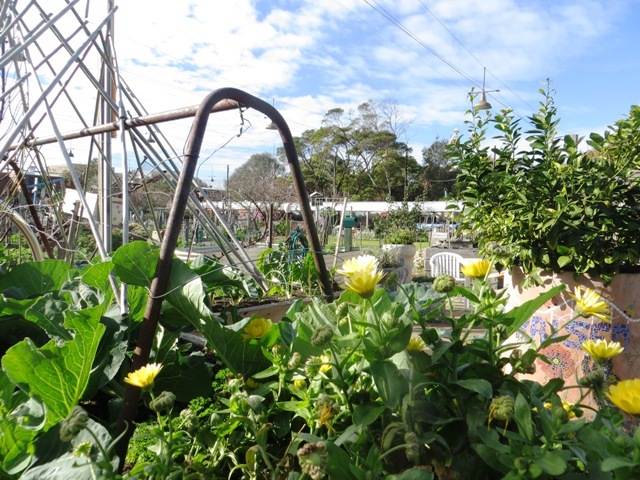 I mean it’s all very good worthy to grow your own vegies and take part in a community venture – but it should be fun, too. I think you can see that, in the pictures on this page – in fact you’ll probably get some good ideas for your own garden! 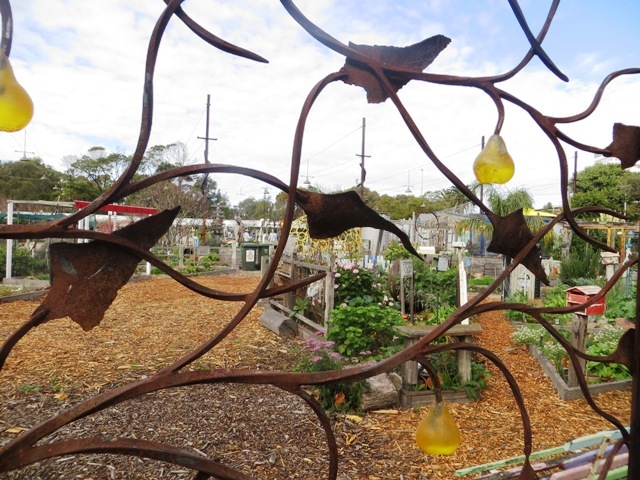 And if you’d like to read more, visit the Veg Out website at http://www.vegout.asn.au/sitelinks.html. 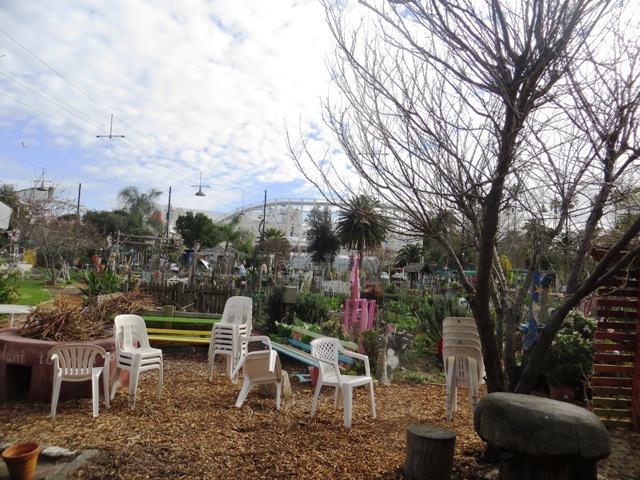 …and plenty of seating to relieve the back! There was a girl once who put her faithless lover’s head in a pot and grew basil from it. That’s according to Keats, anyway. 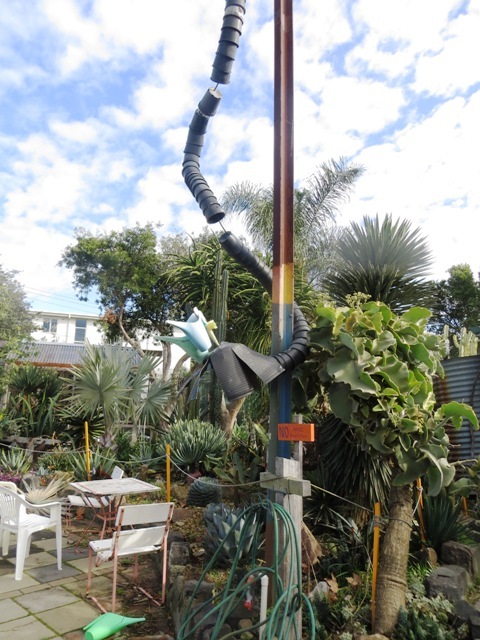 Obviously she had relationship problems and no gardening writer of good repute would recommend so drastic a horticultural practice!. You don’t have to be a New Age back-to-the-earth type to benefit from this life enhancing experience and you don’t need a lot of land either. If you live in an apartment in New York, or Sydney, or London, or Hong Kong, you can still put a bigger buzz into your life by growing at least one herb in a pot. Pot plants are good therapy and a lot less messy and troublesome than pets. Think a pot of thyme can’t love you back? You’ll never know unless you try it. 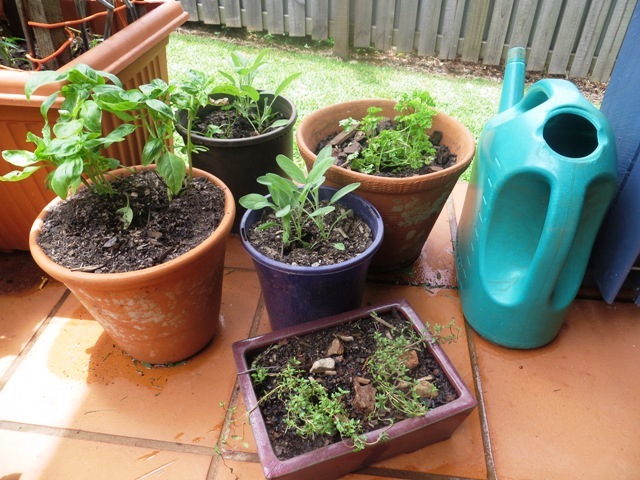 As a gardening writer who has been growing herbs for decades I actually recommend using pots and containers because this way you can better control them. Most common culinary herbs (the only type I bother to grow) are very easy to cultivate but they do have their funny little ways. Pot culture means you can give them just the right amount of sun and shade, food and water, protection from bad weather and badder insect pests. So here are my Ten Top Tips for growing herbs in pots – trust me, you’ll find this a very life-enhancing experience. 1. Grow only those herbs you actually enjoy using to flavor your food. Otherwise it’s a waste of time and effort. 2. Choose those that suit your climate. There are few places on earth where ALL the common culinary herbs can be grown year round (unless you have a heated greenhouse). Most herbs can be grown in summer wherever you live; only in warm temperate to tropical climates can you grow most herbs in winter, though it’s possible to cultivate thyme and rosemary in a sunny spot in a heated apartment as long as the heating is never switched off! 3. Pick a sunny spot. Most herbs thrive only in full sun for at least six hours a day. A windowsill facing the sunniest aspect will do fine. 4. Plant in a good potting mix – this will nourish your herb nicely for most of its life whereas a cheap mix will become hard and claggy and either not drain well or become water-repellent. 5. 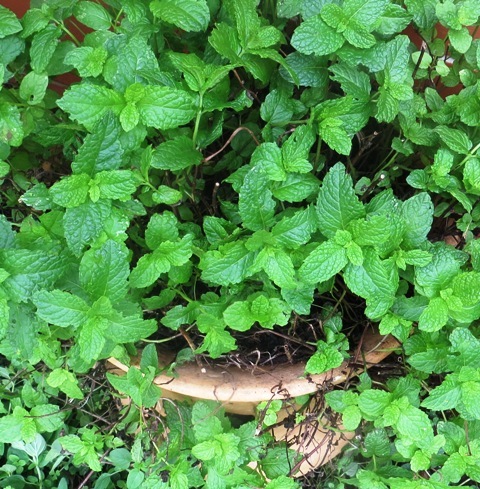 Water regularly but not too much – herbs don’t like to be permanently drenched. If your plant starts dropping leaves or looking sick it needs better drainage so try re-potting. “Crocking” – using broken up pots or large pebbles or small bits of wood at the bottom of your part will improve drainage. 6. Fertilize lightly every couple of weeks with a weak solution of liquid fertilizer. Even if your potting mix already contains (according to the packet) slow-release pellets. I find this latter type of plant food is not really appropriate for herbs grown in pots, but nowadays it’s generally included in the better quality potting mixes anyway. 7. Protect potted herbs from extreme weather such as frost, hot and drying wind, hail or very heavy rain. The beauty of cultivating pot herbs is that they can be moved about to optimize growing conditions. 8. When buying, and unless growing from seed, choose plants that look fresh and healthy in the pot; avoid anything that looks too straggling and has obviously been there so long it’s starting to outgrow its container. I grow my herbs from seed but if you are buying seedlings you get better value from those in punnets of (say) four to six little plants, to be potted on, than larger single specimens in one pot. 9. If you are harvesting your herbs regularly you won’t need to cut them back – just make sure they don’t get too tall or straggly as they will lose vigour and flavor. Trim regularly for longer and better growth. 10. Don’t try hanging on to a herb past its use-by date – unlike diamonds, herbs are NOT forever! Annuals need to be replaced once they have flowered and begun to “bolt”. Perennials become straggly – repot them once a year and give them a good trim back but when they are obviously past their best, chuck ‘em out. After all, herbs are cheap! 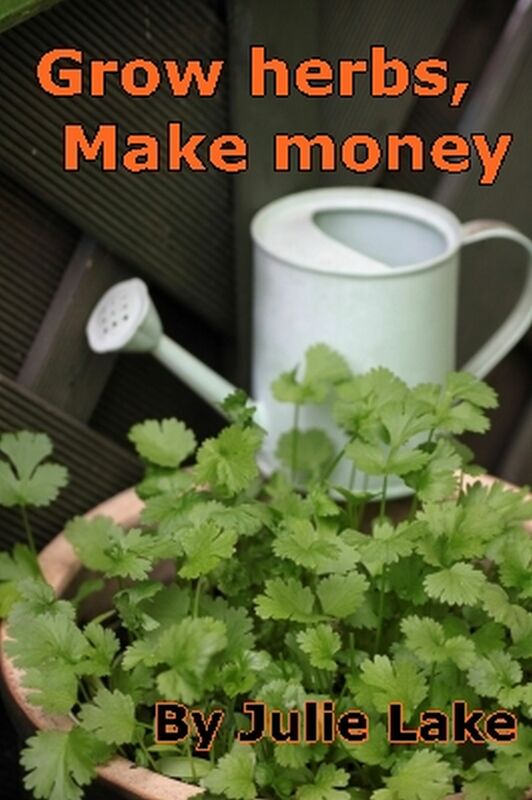 Growing herbs – Ten Top Tips.